From our family home in Tauranga to our fishing spot just past Pukehina, on the Matata straights it was the better part of an hours drive. The weather was looking good, however my father and I were a little dubious about the wind. The weather forecast had told me a 12 knot southerly should have been present, but as is normally the case, you couldn't’t really tell until the kite was in the air. Once we got there we unloaded the quad and took off down the beach. I knew straight away the weather was going to be perfect for us, and as usual, the wind came through as predicted. After stuffing about for an hour or two getting the weight and tack right we baited up the 65kg Dropper Rig with half fresh mullet and half squid tails. Given the area, we were happy to be setting our gear at around 1500m out and we would leave it there for a little over an hour. The first set was a little disappointing, and I was beginning to think it may not be the cracker day that I was hoping for. Just two snapper, one trevally and a kahawai. But at least we had caught some great bait. We sent the second set out with fresh kahawai and mullet. By this time it was getting close to noon and the sun was beaming down on us. After setting the kite and locking the winch, the kite started to move left and right by about 300m as the wind started to become very erratic in direction. As the day was getting on we decided to shorten the sets and try and get in a few more. As soon as the winch took up the slack line on the kite I knew there was potentially something on there, as the wind had died down, but the motor seemed to be working much more than usual. Once the flag started getting close I could swear I saw a decent sized shadow moving in the surf, but quickly put this down to wishful thinking. It wasn't until I locked the winch off and grabbed the dropper that I knew for sure I had caught something large! For the first time ever, I could actually feel the fish fighting when I held the flag, dragging it up the beach. All excited I called for my fathers help, and we soon found out why the line was so heavy. As we dragged it into the shallows I saw the tell-tale green and silver colour I knew all too well to be a kingfish. After getting it clear of the water by a few metres I ran down to pick it up. We had hooked it well, about 15mm behind its lip. After struggling to get the hook out I realized there was something big still left in the water, as it kept trying to pull the dropper back into the water. To make sure our still very lively kingfish wasn't going anywhere, I quickly killed it and dropped it on top of the chilly bin. After pulling in the remaining line we had a total of one kingfish at 32 lb, three snapper, the largest at 11.5 lb, and a large manta ray with a wingspan around a metre on the hail mary hook (the back hook). What a set that was! No wonder it was so heavy, between the ray and the kingy we were certainly up against it! We decided that was certainly enough for a decent feed, packed up and got on our way. Three hours later all 21 of my family were eating kingfish steaks off the bbq. This was by far my most eventful trip to date, and will certainly take some beating! WARNING! 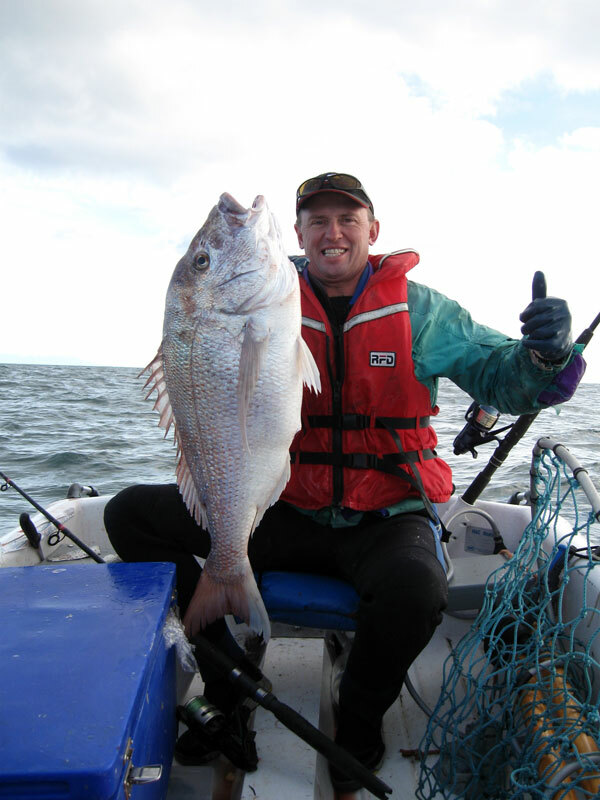 The notorious XOS snapper are beginning to arrive off the West Coast of the North Island. Are you ready? You couldn't imagine just how many times I’ve seen it over the last 20 plus years. Kite fishers stowing away their kite gear or longlines after a fishing trip near the end of summer with intentions of cleaning or doing running repairs before the next trip out. Cold weather sets in, other interests take place of the fishing and the gear is forgotten. Then, the sun begins to shine, the winds blow a steady east or north east, conditions are perfect, and it’s all go! Out comes the fishing gear and it’s off to the beach or out in the boat to take advantage of the first good fishing days of the season. But alas, that knot wasn’t re-tied, that scuffed line had not been replaced, the hooks are blunt, or parts have mysteriously disappeared since the last trip out. The day turns to custard as you see your kite disappear off into the distance, or you lose that HUGE snapper you’ve spent the last four months dreaming about. 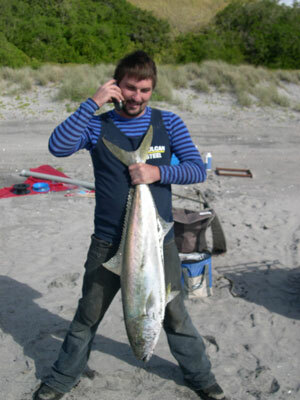 Stop Press: Just got this in from Geoff Preston, he caught it yesterday at Mokau fishing from his three metre MAC boat and we also received another report of even bigger fish taken on a kite rig at Kariotahi Beach. Details of both catches will be in the next newsletter. Do you have plenty of quality Tawa dowel? Too often kite fishers grab dowel from their local hardware stores just to get them through to the end of the season. This dowel is generally pine or beech, is very weak, and will cause your kite to fly erratically or will break very easily. Tawa dowel is recommended for it’s strength, rigidity, and the manner in which it breaks, which is just one of the safety features of our kites. Are your kite rods intact? Carbon fibre kite rods, while extremely strong lineally, can be crushed or weakened quite easily if anything heavy is put on top of them. Run your fingers along the rod or hold the hold at each end and apply a bit of pressure to ensure there are no cracks. Crushed or weakened rods will cause your kite to fly poorly. Are there any holes where there shouldn’t be? Open the kite out and check for any holes, scuffs along edges or fraying. If you catch these early enough it’s usually very easy and cheap to be repaired. 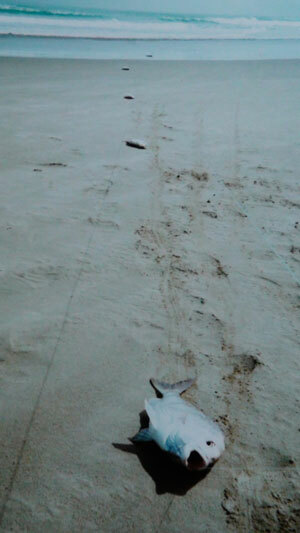 If you think your kites’ beyond repair, give us a call on Ph (09) 634-5005. We can replace your kite skin if all your rods are still intact. Still have your kite safety floats? A good rule to remember: Your line is only as strong as it’s weakest point. If your line has any scuffing or has discoloured in parts, it’s time to replace that section of line. Mainlines can by repaired and wind up at very near 100% breaking strain. A crimped join with a dacron sleeve covered by thin plastic tubing is the ultimate line join and requires zero maintenance, unlike knots that need to be replaced frequently. 28th June: Last week Jamie and I went to Uretiti at my spot X and did two sets at 1100-1200 metres out using salted mullet and oily bonito tied on to the hooks to try and target some larger fish. The results were very good, two gurnard and nine snapper on the first set, the biggest was 2kg. The second set returned another five good snapper. It looks like the fish are in - two weeks before I had only caught seaweed and paddle crabs. 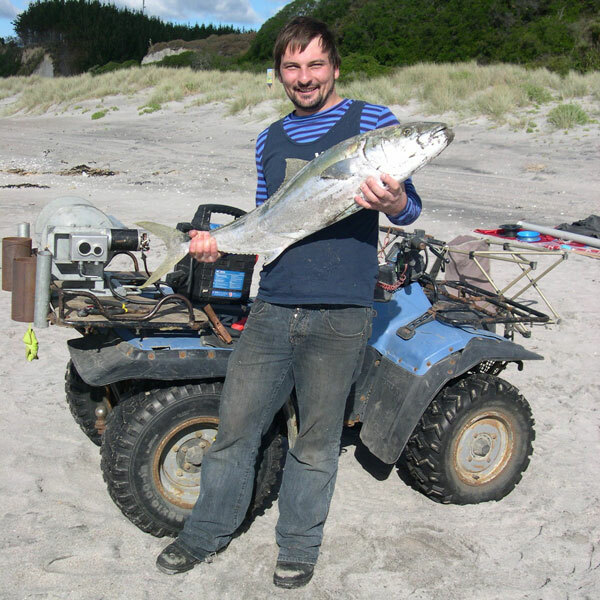 29th July: Went out again to Uretiti Beach and got another nine snapper up to 3kg. I just cant believe that the fishing is going so well in winter. The bloke further down the beach got six gurnard. I am stoked, I have caught 20 legal sized fish in the last two trips to same spot using my mullet and bonito soaked in a brine which I make up at home. I used a super kite today and didn't need the skyhook because the wind was strong. I was setting about 1100 metres out and gave it a long soak of one and a half hours. 4th August: Had a busy week so couldn't get out on the west coast to take advantage of the week of easteries but got a report from Martie Boaks who was using a 65kg Dropper rig at Glinks Gully. He and a few mates fished all day and caught 20 snapper, two kahawai and three gurnard. The best snapper was taken 1300 metres out and weighed 4kg.